Three Sidney Central School students will be featured at the upcoming Jericho Arts Council’s annual student art showcase. The exhibition will be held at the Town Hall Gallery, with the opening reception scheduled for 12-2 p.m. on Saturday, March 17. The gallery will also be open from 6-9 p.m. March 24, and from 3-6 p.m. March 25-29. Senior Gavin Bocanegra, junior Tasha Leykamm, and senior Victoria Prouty have been selected from Sidney. To get to the gallery, enter the Bainbridge town hall, which is located across from the old Jericho Inn Restaurant, and go up the stairs. The exhibition is free and open to the public. 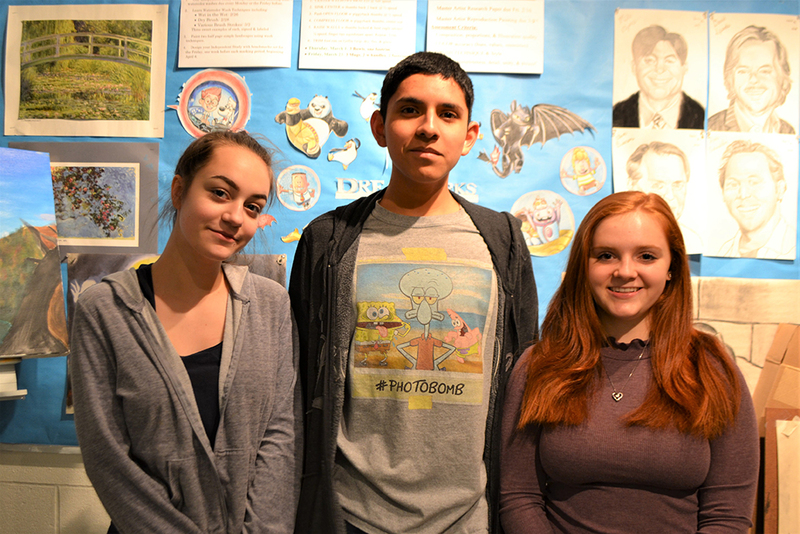 Caption: From left, Tasha Leykamm, Gavin Bocanegra, and Victoria Prouty, were selected to show their art at the upcoming Jericho Arts Council’s student art showcase.